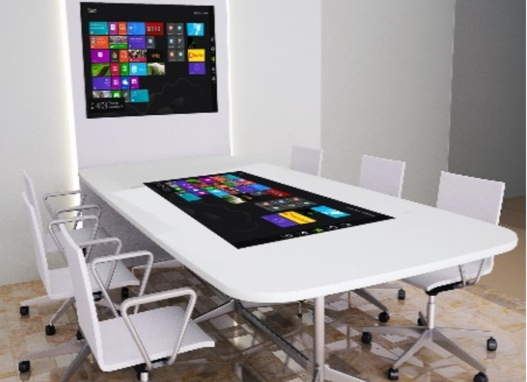 Our award winning company make custom touchscreen meeting tables to the highest standards in the UK. With attention to detail in functionality and design, we make tables that are robust and responsive. Our touch tables are designed to be water resistant, meaning that meetings can take place with drinks as normal, without fear of risk or hazard to the underlying touch technology. A choice of embedded touch screen or through glass touch surface is available. Both touch technologies use toughened glass meaning that the touch technology and screen underneath are extremely well protected from jewellery scratches, knocks, etc. Available in sizes 32” / 42” / 55” / 65” or bespoke. 4K resolution and up to 100 multi touch points options are available on larger touch tables. These tables are custom made to order, to obtain a custom quote please call us on 0151 8080 180 or get in touch initially via our enquiry form.